We had the ultrasound today! So the polls are closed for guessing what flavor it is, now we know :) Everything looks good with the baby for which we are very grateful. It was really cool to get to actually see this baby! I’ve been able to feel it a little bit for the past week or so, and so we were super excited to actually see it. We got some pictures which Eric scanned into the computer so we could post them here. 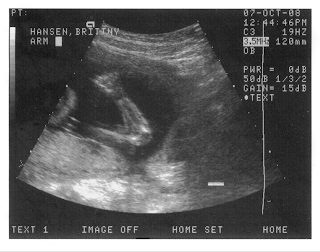 See how good you would do as a sonographer! It was in a very good position for a good profile shot. 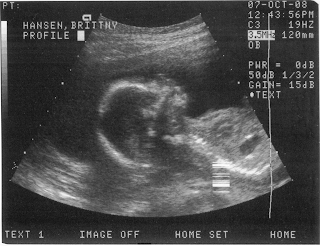 The sonographer kept commenting what a cute profile it was and how lucky we were! 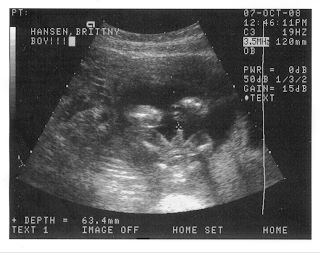 Yup, the poll was absolutely wrong about the gender of our baby – we’re having a little boy! He was very cooperative and was totally spread eagle. No doubt about what kind of baby that is! We’ve decided to call him Gerund until he’s born, because we really like the name, but we realize how cruel it could be to name our kid that for real. As we discuss more names and settle on other favorites we’ll post them and take feedback on them. We’re really excited to get to meet our son in February! 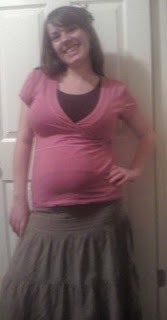 Since this is me, I won’t be doing a novel-lengthed post. I don’t even think there’s much Brittny could write about. BYU didn’t play football this week, but the crazy upset loss USC had was pretty nice for us (even though analysts still don’t take us seriously)! Hopefully we can keep this winning streak going! We are the last non-BCS team to win a national championship, so that would be neat to do it again! We went to the Office Premiere party at Cody & Amber’s house last Friday. It was a ton of fun! I won’t spoil the exact detail, but something has happened that we have been waiting to happen for quite some time. I’m still really enjoying my scooter, by the way. I went to fill up this week–$3.52 and that’s all :) Wish me luck on my skills test (to make my motorcycle license permanent) next week.